This is a print of a waterfall between rocks on a hill. The water falls into a river. Flowers and trees are also depicted. A woman carries a basket on her head while another is seen pulling two donkeys. 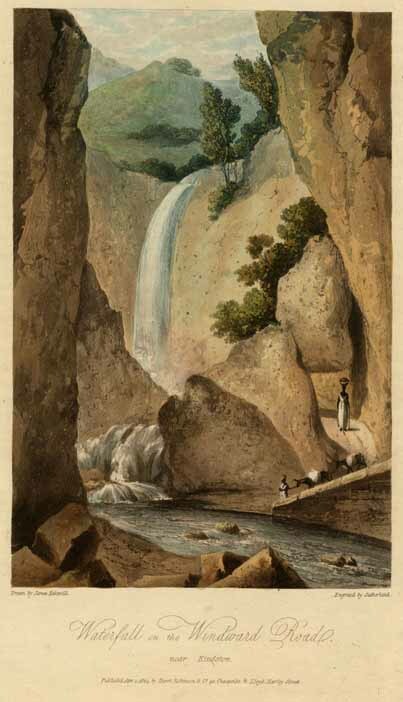 “Waterfall on the Windward Road near Kingston,” National Library of Jamaica Digital Collection , accessed April 20, 2019, https://nljdigital.nlj.gov.jm/items/show/606.